Adding food items to the diary is easy. Search for the product you want to add. Enter the name of the product you want to add in the top right search box in the diary. Click the search icon to perform the search. Alternatively you can use the ‘Add to diary’ button in the side menu or by pressing Alt-F on your Windows keyboard and cmd-F on a Mac keyboard. 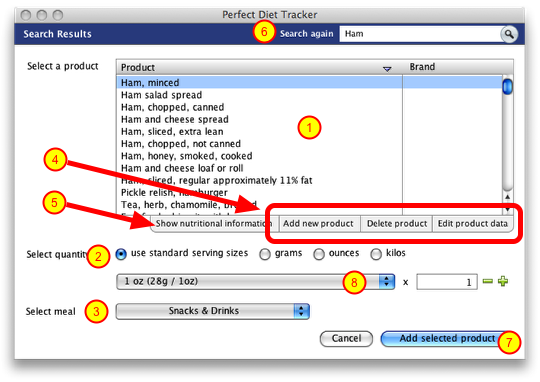 To add an item to your diary select a product (1), then select the quantity (2) and the meal (3) for that product. You can enter a quantity using standard serving sizes, grams, ounces or kilos. For grams and ounces simply select the option, enter the weight and then click on the ‘Add selected product’ button (7). For standard serving sizes select the ‘use standard serving sizes’ option. The default serving size will then be shown, you can change this by clicking on the selection box (8). Finally, enter the number of servings and then click on the ‘Add selected product’ button (7). If you cannot find the product you can modify your search and search again or add the product you want to the main food database (4). If you would like to see the nutritional information for the selected product click the ‘Show nutritional information’ (5) link. You can right click in windows, or control click on a mac in the product selection window to change its name. If you cannot find the product you want to add to the diary, simply click on th ‘Add new product’ link to add it to the database. Manufacturers occasionally change their serving sizes or alter nutritional information, for example to reduce salt in their product. If you find a product that is incorrect click the ‘Edit product data’ to update it. If you have internet searching turned on, the software will also notify Byoni anonymously that the product data may be incorrect so they can adjust the database, this ensures the product database is as accurate as possible for all users. On my first use of diary ‘Breakfast’ came up automatically & I put in my breakfast items ok. But how do I then inset ‘Lunch’ or some other meal as the day progresses? There are a few ways to select the meal for an entry. When you search for a food and select its quantity you can also select the meal from the drop down box. This will then add the food to the appropriate meal in the main diary. The select meal box is labeled with the number (3). If you have already added a food to the diary and want to change its meal, simply ‘right click’ on the item and you can quickly change its meal that way, as well as copy it to other users, or between days, right click is a really useful function in the main diary window. Finally, if you want to move items between meals in the diary you can just ‘drag and drop’ them to the other meal. I want to select a group of food items a create a group. I already have each item individually listed and added in my daily food chart. I simply want to take my sliced turkey entry, cheese,mayo, bread, and group them into a new GROUP called Turkey Sandwich? This should be an intuitive option as people tend to eat the same things repeatedly. Why is this not a simple option? 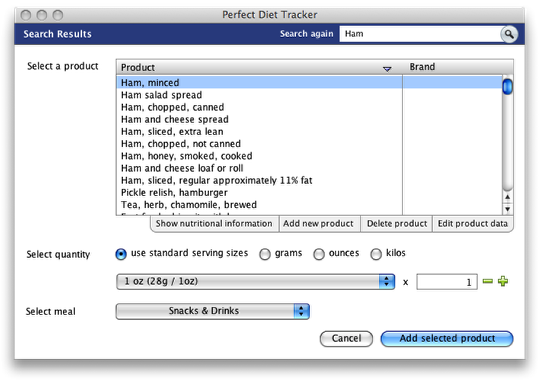 What is the method perfect diet tracker uses to do this? If you select the items you already have in your diary, either by holding down the ctrl or cmd key to select the multiple items, then click on the ‘Group:Create’ option directly below the main diary window, the software will ask you for a name for a new group (for example Turkey Sandwich), then create a group that contains the items you have selected. Alternatively, select multiple items then ‘right click’ and select ‘create group’. The only thing you need to do is select at least two items, or the option to create a group will not be shown. You can then use the ‘Group:Insert’ option to add the group items to your diary on another day, and if you are using version 3.2 or later alter the group quantities, serving sizes etc. The fastest way at the moment would be to go to the day you want to copy the entries from, the right click (or if you have a mac hold down the ctrl key while clicking) and choose ‘select all’. Then right click again and select ‘copy to todays diary’ and all the entries will copy to the current day. Would be nice to be able to duplicate a food in the food database and edit it for minor changes. Useful when entering different flavours of the same basic product, where the values vary only slightly. Are the standard serving sizes as published by the manufacture? For example, If i select one serving of biscuits, does this meal 1 single biscuit or the 2 as stated on the box as being a single serving? Can you also confirm that for meals such as breakfast, I would need to add milk for cereals as a separate food item and that it is not already “assumed”? The standard serving sizes are based on the standard serving displayed on the box or packet data. Where possible we try to expand on this and include a description, eg. 2 biscuits etc. Likewise, if the description does not state ‘with milk’, then you would add it as a separate item. This allows flexibility as some users will prefer more milk than others, or prefer semi skimmed 2% or skimmed milk etc. Is it possible when using two people (logins) to duplicate the group (recipes) on the database. I am currently creating/duplicating my created groups for both logins. Yes. If you enter the group screen and click on the ‘share’ button to the right of the window, you will then be given a list of other users you can share the group or recipe with. Another option is selecting the group items in the diary and right clicking. This will show up a pop up window which lets you copy items to another user, or between days etc. and it handy if you and a partner etc eat a similar meal as you do not have to enter all the details twice. Hi, When you add products – do they then become available for everyone in the database. I ask because both my sister and I have joined and I have added products that she would also like to use and we are not sure if she will have to add them as well – or will they naturally be available on the database? If you have the community internet search enabled then any products you add will be submitted for possible inclusion the community database. As this is reviewed for accuracy any products may take up to 24 hours to be added, or may not be added at all so another option would be to use dropbox on your two computers and share a common database. Usually this is meant for a family group sharing computers, but there is not reason it would not also work well for you. What would happen after it is set up is you would both be able to see each others username, but these could be password protected, and anything you added to your food database would immediately become available to your sister and vice-versa. It also means if you wanted to install on another computer, or add to your diary while at your sisters this would be an option. Is it possible to have a meal appear automatically every day, without habving to copy it. My breakfast is always the same and it would be good not to have to enter it each day. The best option Steve would be to select the items you want to repeat, then right click and select the copy option. You can then go to any other day, right click again and select paste and all the items will be added to that day. Yes, this is in the current roadmap for the software so should be added in an update.